I used to love going to yoga before I had kids, but ever since I did I’ve been finding it hard to go. And because I’ve left it so long every time I go back it feels so hard. I am particularly bad at holding my own weight with my arms, which always spurs self-loathing as I consider how big-boned and heavy I am. On the other hand, I am remarkably flexible when it comes to doing hip exercises, and I am always reminded of how I managed to birth 3 babies in one or two pushes, no C-sections required. Which was a consolation prize after my over-analysed high risk diabetic pregnancies. I have started going to The Centre, a studio a friend has started up, and my yoga teacher explains each move with bio-mechanical exactitude, naming specific muscles and bones as she leads us through a sequence. Today my mat was beneath a hanging orchid flower and it would occasionally spit a gob of water at me. I am wearing green linen pants that I bought at the Gladstone School Gala for 50 cents. All the other yogis wear those tight below-knee lycra pants, but I can’t bring myself to go to a sports store to buy them. I invariably wear the wrong shirt and it flops in my face as I do downward-facing dogs. 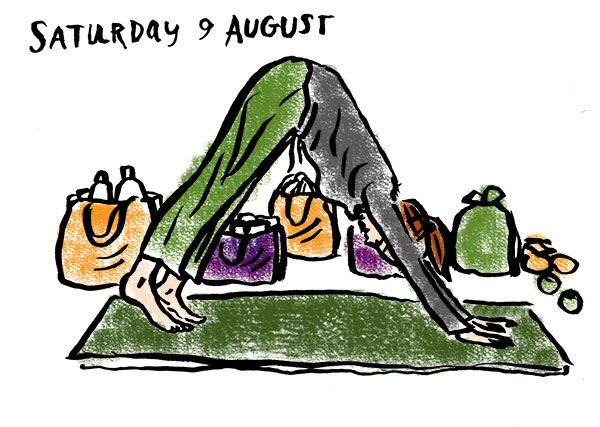 After yoga I go supermarket shopping. I do it as quickly as possible, drafting the week’s menu as I fling cans and loaves into my trolley. Today the checkout operator thanked me for giving him the heavy things first because it made it easier to pack my trolley, and I felt pleased with myself to think that I’d made his life easier, when he had to work inside on such a sunny day.